The first time I heard about Monaco: What’s Yours is Mine was on this very site three years ago with a little news post and a trailer of the game in its early stages of development. Even then, with the rough pixel graphics and a vague outline of the playable characters and their abilities, I was intrigued by the concept: partake in a heist (with up to three of your friends) where you infiltrate a location, grab the loot, and get out again without getting caught. Since that initial glimpse, quite a few aspects of the game - like the aforementioned graphics and character abilities - have undergone revisions, but the core concept has stayed the same. It’s a concept that’s extremely well executed and Monaco is, without a doubt, the best cooperative game I’ve played this year. The basic premise appears straightforward at first. You assume the role of one of four felons - the Locksmith, the Lookout, the Pickpocket, or the Cleaner – each of whom has a unique ability, such as picking locks quickly or being able to spot the locations of guards on the map. These thieves have decided that jail really isn’t all it’s cracked up to be, and it’s time to do what any good bunch of criminals would do: break out. However, their new found freedom leaves them stuck in a hostile country with no money and no way out. In order to solve these problems, they go deeper into the criminal underworld and find new associates (with new abilities), and more problems. The simple plan of break out and get out gets more complicated as, in parallel, the levels themselves get more complex. The overall goal of each level is essentially the same: get in, steal something (whether it is an actual object or a person), and get out. Each level is laid out in a set way with a set number of guards/bystanders, traps, and coins to steal, which increase the number of times you can use special items and also unlock a second, more challenging campaign. While each level varies greatly in these and other aspects, the levels themselves will stay the same no matter which criminal you select or how many other players join you in your extralegal activities. In a typical level you’ll select one of the thieves, get a little bit of the overarching story, and then tackle the mission. Most levels will start with a special item nearby with a limited number of uses. These items range from shotguns that can kill guards to EMP pulses to knock out electronic devices. Your first time through the level you may find it easy enough bypassing some of the obstacles you encounter. Then you come across an area with a lot of electronic traps, for instance. These can be disarmed by using a computer – perhaps inconveniently located all the way on the other side of the area – to generate a virus and disable them. Unfortunately, that means having to navigate through an area with a lot of bystanders that will alert nearby guards the second they decide they don’t like the way you look. You could also just run the risk of tripping the alarms and trying to hide in one of the nearby bushes until the heat dies down. So what do you do? There’s no right answer to this situation; the choice is entirely yours to make. If you should die and decide to keep going rather than start the level over, you will be able to select a new thief. Your new character’s skills may solve the immediate problem of the traps, but he or she may lack the necessary ability to handle challenges further along. No matter how many times you play a level (and if you’re playing solo, you likely will be replaying them quite a bit), it will feel different each time you play it based on the one factor that matters most: how you play it. This is Monaco’s brilliance. Keep everything about a level the same and let the player (or players) decide how best to interact with it. Maybe you play through a level once as the Mole and knock through a bunch of walls, causing a huge ruckus but efficiently getting at the loot. The next time, you play with a friend and you team up as the Locksmith and Hacker, making short work of any doors and traps that attempt to block your path. There is no one solution, there is just a group of thieves out to loot as much as possible. 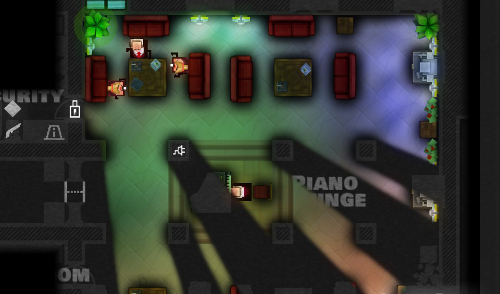 As a result of this clever design, Monaco is not your typical stealth game. While your goal is to infiltrate a place, grab the loot, and get back out again, you don’t exactly have to be stealthy the whole time. In fact, depending on which thief you select, you may intentionally get discovered in order to lure enemies to a certain location. To put it another way: you will be seen at some point so put the whole notion of a “stealth run” out of your head. Stealth is just one tool you have in your arsenal and it - just like the thieves’ abilities and the special items - has its strategic uses and, unfortunately, inconveniences.